The Delines debut album Colfax surprised fans and critics alike. The band had only been together a week when they went into the studio and cut the record. Uncut gave it 9/10 stars and praised its “widescreen romanticism”, calling it “the richest collection of songs Vlautin has written.” Evoking the feel of a beat-up Dusty Springfield or a weary Rickie Lee Jones, Colfax made a dozen top ten records of the year lists and the Delines sold out venues in the UK, Ireland, and had successful tours in the Europe and Australia. The Guardian declared them the surprise hit of the End of the Road festival and then it all came to a stop. Lead singer Amy Boone was hit by a car and put into the hospital and recovery for many months, finally putting the band on hold for over three years. Amy is finally on the mend and The Delines are back with their sophomore effort released next January ahead of their UK tour. 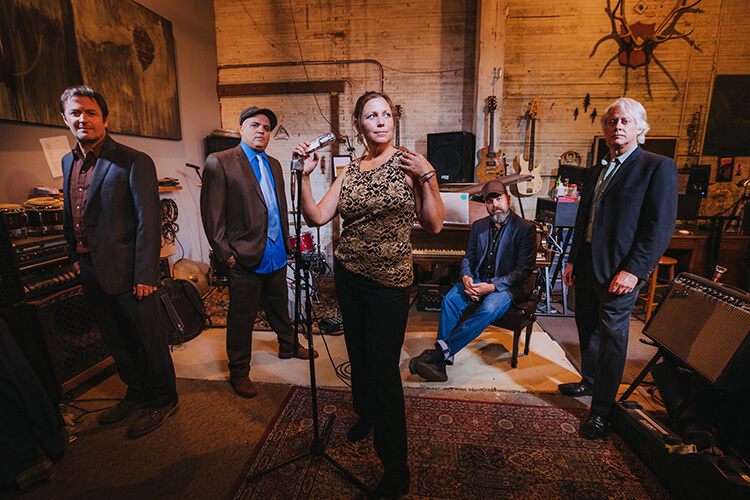 The Delines are led by vocalist Amy Boone( The Damnations, TX), the keyboard and horn work of Cory Gray, Tucker Jackson (The Minus 5) on pedal steel, as well as Richmond Fontaine members: Sean Oldham, Freddie Trujillo, and Willy Vlautin. Vlautin, the acclaimed novelist and songwriter for Richmond Fontaine, has penned all ten tracks. Vlautin’s book Lean on Pete was recently released as a major motion picture. Richmond Fontaine broke up in 2016 after releasing over ten records.